Marrakesh is a Moroccan restaurant located in South Street, Philadelphia. I redesigned their identity, consisting of logo, stationery and menu. Marrakesh serves you as though you were in a Moroccan home. Moroccan rugs cover the floors and walls, and the restaurant is dimly lit by mosaic lamps. You're served seated on cushions and couches, and entertained by belly dancers. My goal was to translate this atmosphere, this traditional and authentic Moroccan vibe into the identity. For the logo I researched Moroccan design styles. I noticed there was a large amount of geometric patterns and tiles. I decided to take advantage of these patterns to create my identity system. The final product consisted of three variations of the logo. The menu was a challenge. 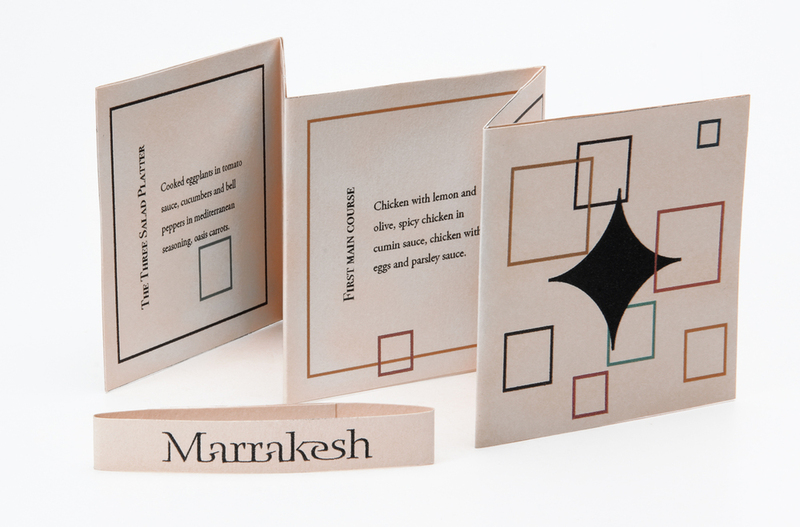 Marrakesh serves a set 8-course meal to all its costumers. There is no real choice of dishes like in a regular restaurant, therefore I had to create a menu that felt suitable and informative. The menu was designed to allow customers to see what ingredients were in each dish, and it was made travel-size so the customers would also be able to take it home.